All three Braveland games are making their way onto Nintendo Switch. They will be bundled together and includes Braveland, Braveland: Pirates and Braveland: Wizards. The turn-based strategy game will launch on March 7th and will cost $14.99. We have the official announcement below. February 18, 2019 — Craving adventure? Yearning for exciting turn-based battles? Longing to explore lovingly crafted lands and lore? Then get set for the upcoming release of Braveland Trilogy, coming March 7, 2019 on Nintendo Switch from developer Tortuga Team. 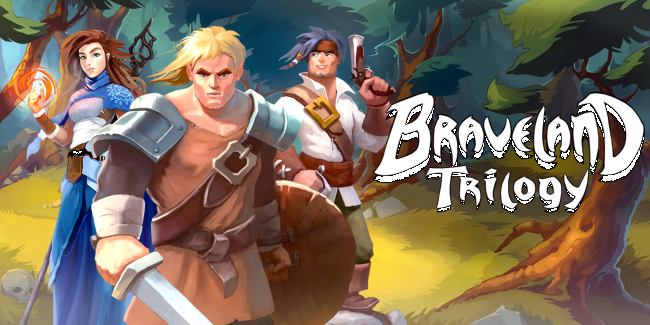 Braveland Trilogy is a compilation of three great turn-based adventure RPGs – the original Braveland, Braveland Pirate, and Braveland Wizard. Each game in the trilogy offers classic tactical combat and role-playing gameplay combined with new challenges, heroes, henchmen, enemies, and environments – with all three versions playable on the Switch for the first time! Braveland is a turn-based adventure game inspired by old-school turn-based games such as King’s Bounty and Heroes of Might & Magic. In Braveland, you start as a humble warrior’s son whose village was cruelly raided – and work your way to becoming the commander of a powerful army. Hand-crafted art complements a wonderful fantasy-based story where your young hero recruits allies to aid in the cause while learning spells and battling bosses on his way to becoming the ultimate protector of the land. Braveland Wizard adds a new twist by placing you in the role of a new graduate of the magical academy. The game adds three schools of Battle Magic, a talent tree for deeper character development, more allies to recruit to your cause, and randomly created dungeons which offer your Wizard all kinds of rare rewards! Braveland Pirate puts you in the role of the sea-dog Captain Jim, as he embarks on a quest to find the Eternal Treasure. Hordes of undead, chests full of gold, devious pirate captains, and breathtaking adventures await you in the Free Islands. This time around, you’re equipped with a sailing ship and a hearty crew, setting sail for tropical paradises loaded with loot! Three-in-one Fun: Get Braveland, Braveland Wizard, and Braveland Pirate all in one great bundle. Each game offers a unique take on your character, from magic schools to pirate tricks, there’s something special about each game in the series! Monster Madness: Each game in the Braveland Trilogy adds more allies to recruit, fiends to fight, and bosses to battle. There’s always something, or someone, fresh to find and befriend, or battle.